Spring Has Sprung – What’s New at the TAM® Office – TAM Card® Nation in Vegas! 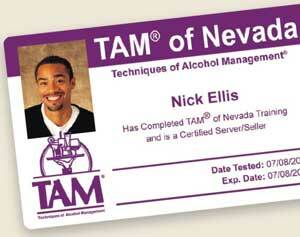 TAM® Card classes are available across Nevada. In addition to online and classroom-based TAM® class offerings six days a week at our Las Vegas office, we are also offering classes and online exam proctoring in Mesquite at the Virgin River Hotel and Casino on the third Wednesday of every month. Proctoring for online students is also available in Laughlin every Thursday from 8:30am-12:00pm at the Laughlin Chamber of Commerce building in the Manpower office. Proctoring for online students is also available in the Reno/Sparks area by appointment. For more information on the schedule, visit our website. Spanish classes are offered at our Las Vegas office. TAM® classes are offered in Spanish on the third Thursday of every month at 9:00am. Students are asked to arrive at 8:30am to register for their class. Additionally, with our classroom-based training option, we offer students the opportunity to complete their final exam in English, Spanish, Arabic, Tagalog, or Korean. Students with English as a Second Language can focus on what they have learned without the additional hurdle of English literacy. Walk-ins for TAM® classes are always welcome at our Las Vegas office, but sometimes our classes do fill up, so make sure to arrive 15 minutes before class starts! If you’re looking for our building, we’re located at 3900 Paradise Road, Ste. 205. You’ll find us in the office building at the Park shopping plaza on Paradise Road, between Flamingo and Twain. You can find our building directly behind the Citibank. Our office is easily accessible by public transportation. Bus stop #108 lets passengers off right across the street! If you are driving, convenient parking for students is available on the side and rear of the building. Handicap parking is available in the rear of the building, and elevator access is available. Parking in the front of the building is limited-time parking only. For answers to more frequently asked questions, check out our blog post, “Have Questions About Your TAM Card? We’ve Got Answers!” We look forward to seeing you at our office this season.